The importance of seagrasses is further emphasised in a new report that looks at how they underpin fishing worldwide. These flowering plants, which grow in near-shore waters, are under intense pressure - some estimates suggest global losses are running at 7% a year. The grasses provide shelter and food for many sea creatures and that makes them a natural draw to fishers. But Richard Unsworth and colleagues say this valuable resource will need better management if it is to be sustained. "Our study is really the first to show just how important seagrass meadows are to fishing," explained the researcher from Swansea University in the UK. 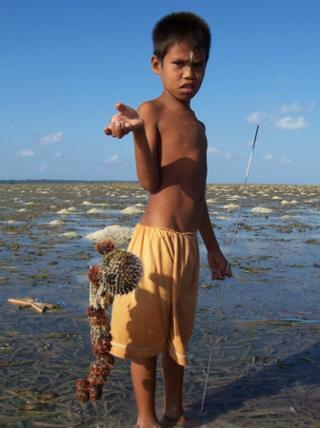 "Wherever you get seagrasses, you get fishing, basically," he told BBC News. Seagrass meadows are found around every continent except Antarctica. The plants cycle nutrients, stabilise sediments, and - as photosynthesisers - act as a "sink" for carbon dioxide. They also provide nursery habitat for juvenile fish, which hide from predators among the stems. However, the scale of the importance of the meadows to fisheries has been more supposition than fact because of a paucity of data on how they are actually used, according to Dr Unsworth. His team set about correcting this by interviewing experts - including other scientists and fisheries managers - on what they were observing around the world. The team also took in case studies covering all regions from the Philippines to Zanzibar, Indonesia, the Turks and Caicos Islands and locations in the Mediterranean. The picture that emerges is much the same everywhere. Fishers actively target seagrasses because they recognise the habitats' great productivity. This is true from small-scale recreational activity all the way through to large-scale commercial practice. The study details the types of tools and equipment used - from spears to nets - and the variety of species taken, from invertebrates such as crabs, shrimp and clams, to popular finfish such as mullet, herring and snapper. One critical point to emphasise from the assessment is that many hundreds of millions of people worldwide depend on the catch from seagrass meadows for their daily protein intake. This makes their conservation and proper management all the more important, says the team. There is a claim that a meadow area equivalent to two football pitches is disappearing every hour. Such statements are very hard to verify, but there is no doubt that seagrasses are being diminished by poor water quality in coastal areas as a result of agricultural and urban run-off, among several threats that also include insensitive fishing practices. Team member Lina Nordlund, from Stockholm University, said: "The ecological value of seagrass meadows is irrefutable, yet their loss continues at an accelerating rate. "Now there is growing evidence globally that many fisheries associated to seagrass are unrecorded, unreported and unmanaged, leading to a tragedy of the seagrass commons." Leanne Cullen-Unsworth, from Cardiff University, added: "Arguments in support of seagrass have in the past too often focused on the fluffy - such as the conservation of seahorses. "I don't want to dismiss seahorses' importance, but the reality is that seagrasses have much higher value in supporting fisheries. And I've come across numerous occasions where fishermen have been against conservation of seagrasses because they can't moor their boats in these locations, when it's those seagrasses that support their activity in the first place. "What we need to do is increase the level of understanding and appreciation of these habitats." The team's study - Global significance of seagrass fishery activity - is published in the journal Fish and Fisheries.